What Makes the Net Gen So Smart? QUICK! Somebody Call the General Contractor! This is the part where I learn how to combine the elements of instructional design with those of project management. I’m smack in the middle of a mountainous instructional design project. I’m building Timeless Tales with Paige Turner, a reading intervention from Istation, designed to teach struggling middle school students the critical reading and language skills they need, presented in an engaging, motivating, technology-driven package. When I started the design work on this project, I was a lone curriculum designer. Now, I’ve got a team of content writers and a team of other curriculum writers all working together to drive the engine that is building this immense instructional product. Now that we’ve entered the development phase for the first section of the program, I’m also working closely with artists, engineers, interface designers, and animators to bring the project to life. And because our customers WANT and are EXPECTING the release of this product, I’m also coordinating with and communicating with the executive management team, the sales and training teams, and the marketing department to construct messages about our delivery timelines, the unique features of the program, its goals, and its alignment to the state and Common Core reading standards that students need to be able to master. The process of instructional design can no longer stand alone. This project requires management, oversight, constant evaluation, and the delicate dance of interdepartmental coordination within a growing corporate culture. It’s not enough to simply design good instruction. The instructional designer “must use the process steps in instructional design with project-management methodology” (Cox, 2009). That means that the steps in the instructional design process must work in tandem with project management principles. It’s not enough to know what the project is supposed to look like. It’s also critical to know and be able to answer HOW it is going to be produced. Let’s say this project started out like a single person setting up a flagpole. Over time, as the whole thing has taken shape, and the scope, the team, the company, and the demand have all grown, it’s now more like an entire construction crew building a house. ADDIE. Analyze, Design, Develop, Implement, Evaluate. This is the standard for instructional design. What if we applied it to the building of a house? A – Analyze. This is the part where the builders take measurements of the site. D – Design. This is the part where they create and provide blueprints, the plan for the house. DI – Develop and Implement. This is the part where they actually build the house. E – Evaluate. This is the final inspection. So what about the project management piece? That’s where the general contractor comes in! Thank goodness, because for a project of this scope, it’s important to have somebody keeping track of how this house is being built. The general contractor must determine the sources and costs for all of the building materials. The general contractor must also determine and communicate with all of the stakeholders for the project. He’s got to work with the buyers, the vendors, the subcontractors, the zoning officers, the inspectors, and all of the laborers, too. The general contractor must stay abreast of the progress on the project. He’s got to be able to communicate about progress to all of the stakeholders along the way. He’s got to know where the project is, how much time and cost each part of the house is going to require, and he’s got to be able to keep the project on schedule. And finally, he has to be able to ensure that the quality of the finished product meets expectations, from the planning phases all the way through to the final inspection. In my world at Istation, with Timeless Tales, it’s time to call the general contractor. It’s not enough to have a solid instructional design plan and a team in place to execute that plan. It’s time for some serious project management. In fact, I don’t need to just call the general contractor. I need to learn how to be one. Common Core State Standards Initiative. (2013). English Language Arts Standards: Grade 6. Cox, D. M. (2009). 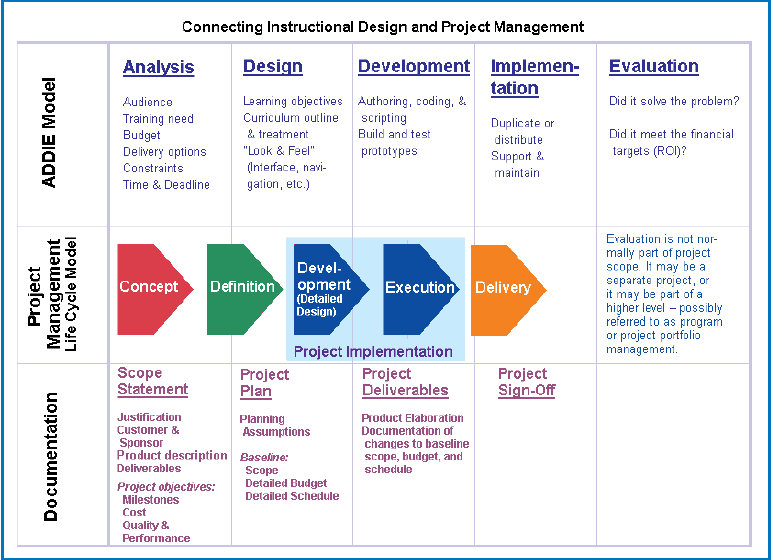 Project Management Skills for Instructional Designers. Bloomington, IN: iUniverse. Hodell, C. (2011). ISD From the Ground Up: A No-Nonsense Approach to Instructional Design. Chelsea, MI: Sheridan Books, Inc. The eLearning Guild. (2013). Closing the Loop in e-Learning Development: How to reconnect instructional design and project management. Learning Solutions Magazine.